Happily Ever Elephants’ Guide to the Best Board Books, featuring our selection of the Best Books for One Year Old and Best Books for Two Year Old Kids! We’ve got a phenomenal list of the very best board books for your little one! If you have a baby or toddler at home, these are some of the best books for your one year old and best books for your two year old kids. Our selections include black and white books for babies, interactive books for toddlers, alphabet books for toddlers, the best board books for teaching toddlers color, concept books and so many more. We hope you find this guide helpful, and we hope you find your next favorite children’s books right here! *This content contains affiliate links. Oh, the wonderful world of board books! We hope you love these selections and find them as valuable and engaging as we do. It is so hard to pick from the wide array of board books on the shelves these days, especially when you are trying to teach your babies and toddlers new concepts. These are some of the best books for one year old kids and the best books for two year old kids! Happy Reading! Hello, Bugs!, by Smriti Prasadam and Emily Bolam: When a new baby’s vision is developing, the easiest books for him to “read” are those with black and white pages, simple lines and bold patterns. We love black and white books for babies and this one, with its small splash of glitter colored foil, is a winner! This introduction to ten bugs will delight your little ones! Look, Look!, by Peter Linenthal: This black and white book is more than twenty years old, and it is a best seller for a reason. Cut paper art depicts children running, fish swimming, cars racing and stars shining. The book is sturdy for tiny hands and includes some contrasting splashes of red, making it a perfect first black and white book for babies! Black & White, by Tana Hoban: This is one of our very favorite black and white books! It was by far a family fave when my boys were infants. Black & White is an accordion style fold out book, allowing it to stand on the floor on its own. It features fourteen high contrast images, and it is a perfect visual for babies to watch and explore when they are doing that all important tummy time! My Animals (BabyBasics), by Xaveri Deneux: What little one doesn’t love peek-a-boo surprises? This fabulous black and white book for babies is an amazing addition to a baby’s first library, featuring peek-a-boo holes that allow toddlers to grab and turn the pages themselves. Little kids won’t be able to keep their hands off of this one. Guess Which Hand, by Hans Wilhelm and illustrated by Ilaria Guarducci: You guys. This book is genius! Think of hiding a small object in one of your tightly-fisted palms and asking your kiddo to guess which hand the object is in. Well, Guess Which Hand is exactly that — in board book form with a wheel to turn and flaps to lift. This is one of my favorite interactive books for toddlers and has become a go-to book for baby showers because of the joy and wonder it elicits in little ones! 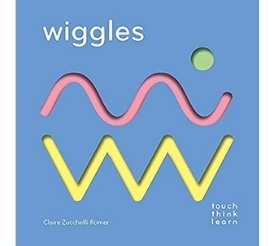 TouchThinkLearn: Wiggles, by Claire Zucchelli-Romer: Little hands will get a workout with this fabulous book that encourages toddlers to trace their fingers along grooved paths that zig and zag and twist and turn. Our littlest readers are encouraged to play and explore in this hands on book that provides young kids with an amazing multi-sensory experience. An awesome book to enhance our children’s fine motor skills, and this entire TouchThinkLearn series ranks super high on our list of best board books! You will see more below! Chomp Goes the Alligator, by Matthew Van Fleet: This is a touchy-feely concept book, teaching kids how to count while also giving them a way to work their fine motor skills with a pull tab that makes the alligator’s mouth open and close. This book is a total winner for the younger set, and it will have your kids chomp, chomp, chomping all day long! Such a fun interactive book for toddlers, and your kids won’t be able to keep their hands off of it! Feelings (Pull and Play), by Alice Henand and Thierry Bedouet: Oh, how I love this concept book! Encouraging even our littlest children to learn about and discuss their feelings is so important, even at tender young ages. Using pull tabs, kids will be excited to identify and learn to vocalize how Little Crocodile and his friends are feeling on each page. We love this one! 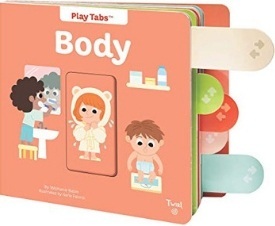 The Human Body (Play Tabs), by Stephanie Babin and illustrated by Ilaria Falorsi: We love these sturdy tabs that encourage kids to push and pull in order to learn about the body. This book has a lot of text, but you can choose to read small portions of it for your littlest kids and or all of it for your older ones. It is a fabulous introduction to the human body, teaching kids about the five senses, their skeletons, and how to take care of themselves. Such fun interaction, and your kids will love figuring out which direction to pull the tabs! Mon Petit Busy Day, by Annette Tamarkin: This is a phenomenal oversized board book that offers hands on activities for toddlers. Little readers will trace lines with their fingers to promote fine motor activities, play memory games while learning their shapes, and learn their left from right through clever tabs. This is such an engaging book that offers a different learning experience on every page! Part concept book, part interactive book for toddlers, and so wholly engaging. 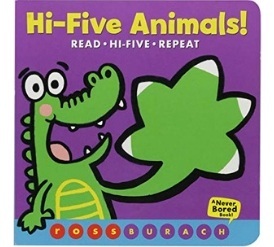 Hi-Five Animals!, by Ross Burach: Kids will absolutely adore giving “hi” fives to all of the animals that greet them in this adorable book. From animal sounds to bright pictures to interactive fun on every page, your toddlers won’t stop wanting to high five you, because this engaging book will have your kids giggling long after the final page. Such a fun board book for your littles! Peek-a-Who?, by Elsa Mroziewicz: We absolutely adore this unique board book, and each time we picked it up, my kiddos eagerly unfolded the pages to find out what animal was hiding behind each flap. This book is beautiful in every way, from its clever design to its stunning illustrations. An absolute gem, and another awesome book to give to a new parent! That’s Not My Puppy…, by Fiona Watt: Both of my kids were absolutely enamored with Usborne’s “touchy-feely” books, particularly the “That’s not my…” series, and I can say with out a doubt that these tactile, interactive books for toddlers are some of the best board books out there. Each book in this series features an animal, person or object combined with simple repetitive text. Each page invites tiny fingers to explore various different textures (fuzzy, rough, soft, bumpy, etc). The books are sturdy and well built, the illustrations are bright and fun, and the textures help develop and stimulate sensory skills. Hug Me Little Bunny: Finger Puppet Book, by Chronicle Books: If you love finger puppet books, you will adore both this book and Hug Me Little Bear! We love the way these books explore the various things parents can do with their little ones, from hugging to playing to sharing. Such a fun interactive book for toddlers, and we just love it! AlphaBlock, by Christopher Franceschelli and illustrated by Peskimo: This book rocks, plain and simple! It features thick pages, each cut into a capital letter that children will enjoy tracing with their fingers as they familiarize themselves with each letters’ lines, curves and holes. Even better, it presents a peek-through guessing game as kids will use the letter and illustrated clues to determine what word beginning with that given letter is presented on the next page. Genius! Arf Buzz Cluck: A Rather Noisy Alphabet, by Eric Seltzer and illustrated by David Creighton-Pester: This alphabet book for toddlers is such a delight and so much fun! Little ones will love learning the ABC’s with this clever book that uses animal sounds to emphasize each letter. It rhymes, it’s bright and it’s catchy — and it will have your kids Mooing, Neighing, Oinking and Peeping along! TouchThinkLearn: ABC, by Xavier Deneux: The TouchThinkLearn books are, in my humble opinion, some of the best board books on the market, and ! absolutely adore their alphabet book for toddlers. The raised die-cut pieces make this ABC book a tactile experience so different from the other alphabet books out there. The graphics are simple and bright, and this book so brilliantly engages children on both visual and sensory levels, creating a much more immersive way to learn ABCs. Amazing! The Usborne Alphabet Picture Book: This was another one of the best board books in our house! It is big, sturdy and tabbed, making it simple for toddlers to find and flip to their favorite letter, the first of which is typically the first letter of their first name. We love the way it includes both uppercase and lower case letters in combination with a fun, large illustration. A B SEE, by Elizabeth Doyle: Oh man, is this book an absolute beauty! Each page of this book features an oversized capital letter, and when you look closely, you will find that each letter is composed of gorgeous images beginning with that particular letter. A includes apples, airplanes, automobiles and an alarm clock, whereas M includes a manatee, moon, mitten and monkey. Even better? Each page includes one alliterative line of text corresponding to each letter. An exquisitely gorgeous alphabet book for toddlers! 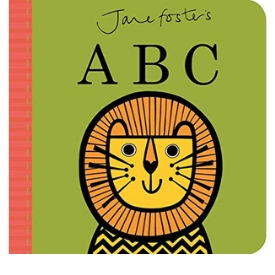 Jane Foster’s ABC, by Jane Foster: We adore this striking and simple book that uses fun animals and objects to teach the toddlers the alphabet. The pictures contain clean lines and bold colors, with simple text on each page. Bonus? The easy to read text and capital and lower case letters contained on each page! Look, Look Again, by Agnese Baruzzi: My boys were mesmerized by this book! We love the way it asks toddlers to take a close look at one simple object and then guess what it may turn into when they open the page fold. With each page fold, the number of animals on the page increases, from one all the way to ten. Toddlers will be mesmerized, and your older children will love making predictions and guesses. Such fun, and one of the best board books for two year old kids! Stack the Cats, by Susie Ghahremani: This is such an adorable book that has kids counting from one to ten while also introducing other mathematical concepts. Toddlers will be in awe of the cute kittens, and parents will enjoy helping their kids think beyond counting by introducing simple addition and subtraction, too. So clever and a total gem! Flora and the Chicks: A Counting Book, by Molly Idle: Molly Idle is a genius when it comes to children’s literature, and she has recently brought her award winning Flora (from Caldecott Honor winning Flora and the Flamingo) to board books. What will happen when all of the eggs in a nest begin to hatch? Will Flora be able to count and keep up with this bevy of chicks? In this adorable and elegant book, kids will learn to count along with Idle’s beautiful illustrations and sweet little chickies. Flora has our hearts! Countablock, by Christopher Franceschelli and illustrated by Peskimo: Like Alphablock above, Countablock also gets two trunks up for its thick pages cut into the shapes of numerals and the way it encourages readers to guess at what is hiding underneath each one. With numbers ranging from one to one hundred, we love the way this book allows children to learn the lines, curves and holes associated with each number, as well as numbers beyond the basic 1-10. Counting Kisses, by Karen Katz: This is one of the most treasured stories on our shelf, and the very best board book to teach counting for the way it encourages affection and play between parent and child. In this story, a tired baby is getting ready for bed. What follows is a countdown of kisses given to the baby by all members of her family, starting on the babies' tiny toes, then going up to her belly button and on to the top of her head... Until, of course, the baby falls sound asleep. For our full review of Counting Kisses, click here! DK Braille: Counting: This book is incredible! It was designed specifically for children with visual impairments and blindness, thus it features braille letters and other fabulous tactile elements. Die cut pages, textured insets, and high contrast images combine to take kids on a counting adventure. This is a hands-on book that will benefit each and every child, and it is definitely one of the best board books to teach counting! 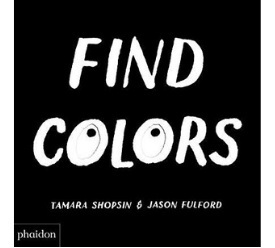 Find Colors, by Tamara Shopsin & Jason Fulford: This book is fabulous! You probably never thought you would be teaching toddlers colors through a black and white book, but the beauty of this one is that it allows kids to walk around and hold the die-cut pages over various objects to find the colors themselves! This is a fantastic interactive book for toddlers and their parents, and I simply love its unique and engaging approach! Zoe and Zack Colors, by Jacques Duquennoy: Teaching toddlers colors is so much fun when you have an innovative book like this one! In this cute book sure to entertain your little ones, Zack and Zoe have their paint brushes in hand and are seeking to paint shapes all different colors. But what are they turning the shapes into? You can turn the acetate pages to find out how colors transform the world and spark imagination! Black Bird Yellow Sun, by Steve Light: We love Steve Light’s work, and this simple yet perfect book is wonderful! Toddlers will take a journey with a black bird as it flits and flies from one spot outside to another. The black bird flies above the green grass, past orange leaves, and under pink flowers. A beauty, and so very perfect to teach your youngest babes colors. This is one of the best books for one year olds! Color Wonder Hooray for Spring, by Chiêu Anh Urban: Kiddos will love learning with this unique book, complete with two interactive spinners that allow them to create colors right in the middle of the flower. This book is a gem for teaching toddlers colors and color mixing, because its two different wheels make it easy to show what happens when, for example, red and yellow are mixed to create orange! Better for your older toddler, we say this is one of the best books for two year olds! Clever Things to Learn: Search and Find Colors, by Clever Publishing: I also love teaching little ones colors through books that group various objects by color, and this is one of my favorites for that purpose! Each spread is devoted to a single color, and each includes numerous items in that respective shade. Both a seek and find and a color teacher, this one rocks! House: First Word Board Books: 5 Books Inside: This fabulous set of board books is a wonderful little gift! One box contains five books, and each book contains several words associated with that particular room. The five rooms include the living room, bathroom, kitchen, garage, and bedroom. The books are stylish and artsy, and they are wonderful for promoting relevant vocabulary pertaining to the home! Baby’s First Words, by Stella Blackstone, Sunny Scribens, and Christiane Engel: We adore this book of first words which is definitely in our collection of best books for one year old kids. Why? Just look at that beautiful cover, with its diverse representation and alternative family structure. It is simply wonderful, and I love the way it tells the child’s journey as she goes about her day. We love diverse books, and this is such a great introduction to vocabulary for little ones! First 100 Words, by Roger Priddy: This is a wonderful first word book for babies and toddlers due to bright colors and every day words. It is a sturdy and simple page turner, with real photographs on each page, making it easier for little ones to identify the words that match the pictures. My boys loved this one! Toesy Toes, by Sarah Tsiang: Did you know research has shown that babies love looking at photos of other babies? This is one of the reasons we love Toesy Toes, both for its real photographs, and for the way it celebrates those cute little piggies in a variety of different situations. If you love playing “This Little Piggie” because you can’t get enough of your toddler’s tiny feet, this is just the book for you! Making Faces: A First Book of Emotions, by Abrams Appleseed: This is another one of our best books for one year old and best books for two year old kids. Babies in real photos make faces depicting various emotions, namely, happy, sad, angry, surprised and silly. The reader is asked to match the emotion to the baby face, and then to make their own faces. The mirror at the end of the book makes this one a total winner. Love! Kiss by Kiss, by Richard Van Camp: One kiss, two kiss, three kiss, four! This is the most adorable book, and though we could have put it in the section of counting books above, we love it even more for its gorgeous photographs showing a diverse group of men, women and children, and for its bilingual text (it is written in English and Plains Cree!). Stunning, sweet, and oh so much fun. Who doesn’t love learning to count kiss by kiss? Will Bear Share, by Hilary Leung: Oh my, we are absolutely in love with this book, one of four in a series which makes for an amazing toddler book set! In this particular book, Bear has a lot to give. But she only has one ice cream cone. Will she share? These humorous books explore simple concepts through expressive animals and simple, catchy sentences. I truly adore these! Other titles in this series include: Will Giraffe Laugh, Will Sheep Sleep, and Will Ladybug Hug. Rhymoceros, by Janik Coat: This is one of three books in another fabulous toddler book set that explores rhymes, opposites and homophones. In this particular book, a blue rhinoceros explores 16 pairs of rhyming words, such as sad and glad, and hat and bat, These are high concept books that encourage young readers to think and imagine, and we can’t rave about these books enough. We think these are some of the best books for two year old kids and older, and we love the other two books in the series, Hippopposites and Llamaphones, just as much as this one! TouchThinkLearn Opposites, by Xavier Deneux: These concept books are fabulous, and like the above, this series would make an amazing toddler book set perfect for new babies! These books are so valuable in that they create sensory experiences for toddlers to learn new words and ideas. This particular book explores opposites such as day and night and big and small, and we simply love it! In addition to Opposites and ABC (above), the TouchThinkLearn series includes Shapes, Colors, and so many more! Happy Grumpy Loved: A Little Book of Feelings, by Kanae Sato and illustrated by Ruth Satin: This is another three book series of concept books that we just love! This particular book explores various emotions. 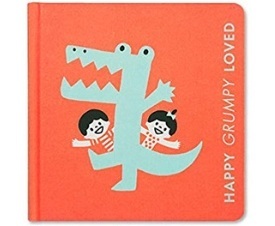 It utilizes only one word on each page, but the adorable crocodile and the two expressive kids convey the meaning of the text beautifully. This series of concept books also includes Wiggle Jump Tickle: A Little Book of Actions, and Hide Seek Stinky Sweet: A Little Book of Opposites. Gossie, by Olivier Dunrea: I have read this book so many times I can recite it by heart, at any time of day. This was a huge winner in our house, for we adored its lovely rhythm and cadence. Though it is simple, it has enough of a story that it keeps preschoolers thoroughly engaged and entertained as well. The best part about this story? It imparts to toddlers how sweet it is to share. There’s nothing better than that! For our full review of Gossie, click here! Mama Do you Love Me, by Barbara M. Joosee and Barbara LaVallee: A parent’s love is forever, and this stunning book celebrates that very concept as a young child seeks to test her independence. It is a beautiful story of an Inuit mother and daughter, conveying the universal message that a parent’s love is timeless and unbreakable. A tender story combined with exquisite illustrations make this a classic!! Little Chickies/Los Pollitos, by Susie Jaramillo: A fun bilingual book with a coordinating app that tell the story of three chickies (los pollitos) and their mother hen. We adore the way this book highlights unconditional love between parents and children, and, lets be honest, the song on the app is so much fun and will have you singing for days on end! 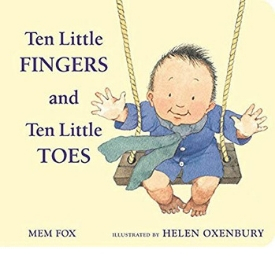 Ten Little Fingers and Ten Little Toes, by Mem Fox and illustrated by Helen Oxenbury: This books is such a treasure! We simply adore the manner in which it celebrates diversity, highlighting our differences in lifestyle and culture while at the same time recognizing that we are all one and the same. It offers a poignant and profound message to share with even the youngest of children, and we think this is a must have book for your little ones. For our full review of Ten Little Fingers and Ten Little Toes, click here!